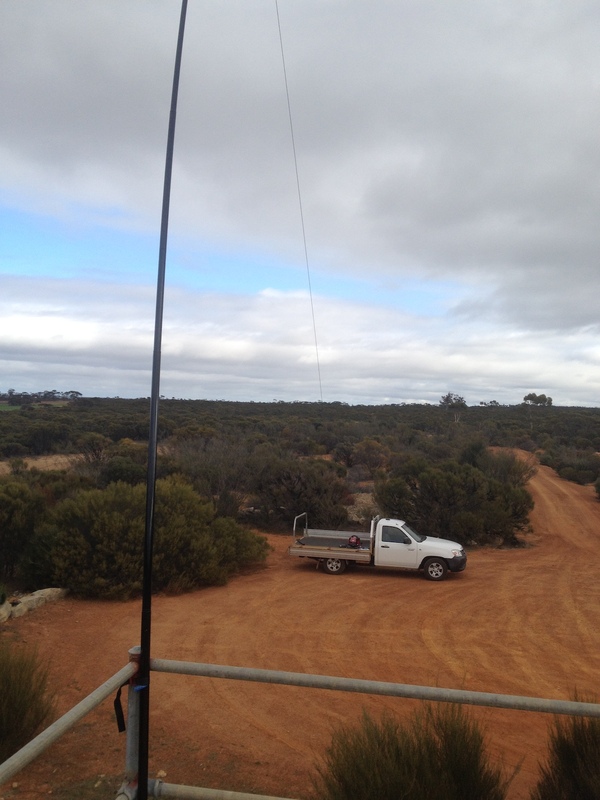 So, I ended up with a six metre pole but the east/west antenna at the east end was probably seven or eight meters up from ground level then sloped down to my ute where I had set up. As my 40m dipole at home tunes up on a couple of bands, I was hoping this arrangement might be multi-band as well, but no luck there. 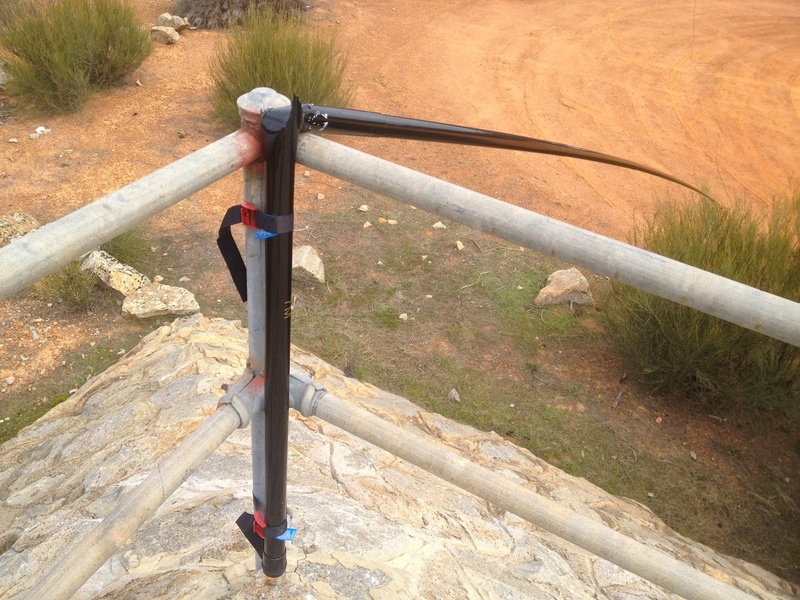 Lesson 2 – 20m end-fed antennas are good on 20m. In any case as soon as I tuned up on 20m it was clear this was a whole lot better from a noise point of view than at my house. I don’t want to say the noise was S1 – because I don’t quite understand the interaction of my S meter and the RF gain control, but it was substantially quieter. Tuning around the band I found plenty going on – several eastern states VK’s rag chewing and some DX from ZL, Germany and Spain. There was a very quiet but readable portable station in Florida, VE2MW. He was the first operator I heard who was ‘only’ running 100 watts into a modest antenna. Everyone else I heard discussing their station had big beams and high power. A little later I heard a really nice signal from Peter G2YT in England chatting to a VK5 who was running 100W into a mobile whip. From the conversation it sounded like Richard VK5ZRY had initially made the contact with only 2.5W, so that cheered me up a little and I decided to have a go. I heard a Spanish station Juan, EA5CTE finishing up a QSO with a ZL, so keen for my first ever HF contact I answered his CQ. He was clearly struggling to make me out, but after several tries with a partial call we got through our calls, names and a signal report. Since I was obviously such a small signal at his end I was very grateful – Juan persisted; getting me to repeat things long after I guess most would have given up. Almost immediately after this I tuned back up to where I had heard Peter & Richard and they sounded like they were finishing up. I glanced over at my tuner, wondering if I’d need to retune, then remembered: I hadn’t reset my power after tuning – I’d completed my first HF contact with Juan in southern Spain on only 5W! No wonder the poor bloke had to work so hard to make me out. I feel bit bad about it. Lesson 3: Although it’s good practice to tune up with low power, you need to wind it up again after. As I set my radio back to 100W, Richard signed off and Peter called CQ. I answered and was thrilled to hear his reply. He had to work a little hard at the start of the QSO (I was 4-4) but we had a lovely conversation and he was suitably excited about being my second HF contact. I think we probably chatted for 15 minutes or so and he struck me as a terrifically nice guy. So, all in all, a great day. My first HF contacts both DX and both operators who were nice enough to work at pulling my mouse-powered signal out of the noise, especially Juan for working an unintentional QRP! I hope to become the sort of skilled and caring operator on HF that these two blokes are. Posted on July 14, 2015 by I Bailey. This entry was tagged antennas, DX, FT-857D, HF. Bookmark the permalink. Nice work. Try grounding your tuner to the ute’s tray to act as a counterpoise to the longwire. Yeah, thanks for the suggestion Martin. I actually did give that a try, I was surprised when it didn’t appear to make any difference to the noise or the signals on 20m. Are you saying that if I got a good earth my 20m wire could act as a 1/4 wave on 80? I’d probably have to shift it to the centre pin of the non-balun input on the tuner too? This is such a convenient spot for me, I’m thinking about concreting some mounts for antenna supports so I can get everything up a bit. Banging in an earth stake would be no problem as long as it was not a trip hazard. 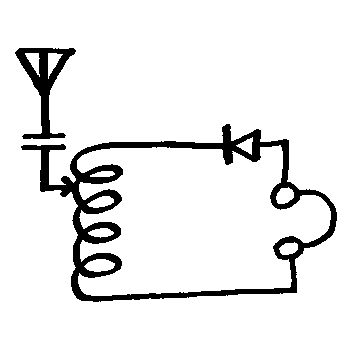 The counterpose is to improve the radiated signal. Unless you are near saltwater most ground stakes don’t make efficient counterpoises. The metal of the car body plus a ground stake should help you tune up on other bands. Hi have you considered a Summits on the Air (SOTA) activation? 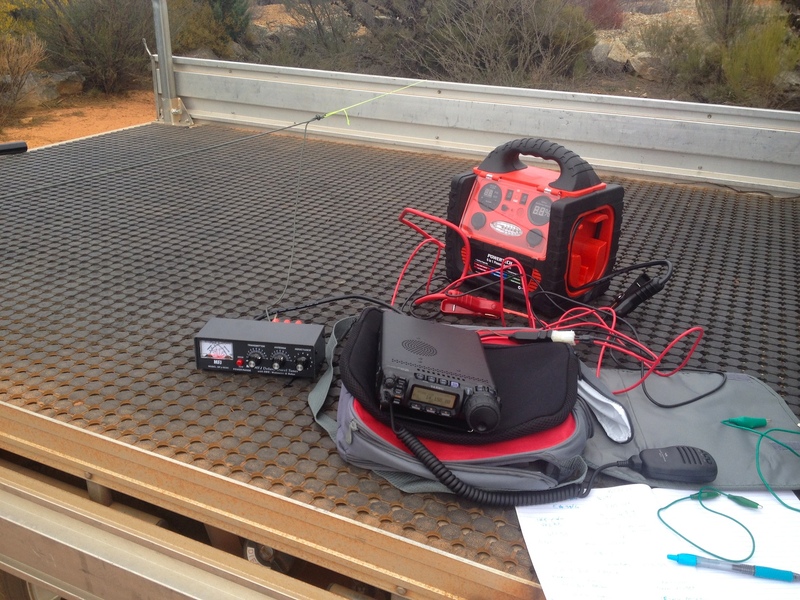 I use my FT’857D for most of my mountain top activations, powered by a 4.2 Ah 4S LiFePO4. Cheers Andrew VK1AD. Hey Andrew, It’s on my list. In fact I have a virtually identical power setup to yours (except I use XT60’s instead of powerpoles), just looking at your blog now I suspect you may have given me the idea! I started out with my RC LiPo’s and came to the same conclusion.